RankOneSports is an online athletic management program used by Franklin ISD athletic department to create schedules and schedule updates. As a parent/guardian you can stay up to date on all scheduling information for your child’s youth sports by signing up. Follow this link for step by step instructions. In the summer of 2018, the FISD Safety Committee was formed with the goal of ensuring each student and staff member an environment where they can be emotionally and physically secure. The charge of this committee was to discuss how to help make improvements upon the school district’s current safety policies and procedures. Click the link above to continue reading. All parents/guardians must complete enrollment forms using the txConnect parent portal. This includes all new students and returning students. Click the link for more details on how to complete your enrollment forms. Effective May 1, 2018, payments for Franklin ISD taxes will be collected by the Robertson County Tax Office. Franklin ISD will no longer collect taxes at the Franklin ISD Admnistration Building. Franklin ISD will update the district website, Facebook page and Twitter account as events unfold and rapid communication is needed. Along with those outlets we use SchoolMessenger to communicate from the district level. 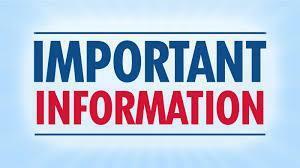 As a parent you have indicated your email address and phone number to call when you registered your child.